Thank you all so much for participating in this round of Cook the Books. I was quite pleased that you found the book very appealing both as a read as well as a cooking inspiration and that most of you wanted to cook I hope to have you with us for next round as well. Elizabeth Bard will be sending us her verdict soon, so stay tuned. 1. Eliot of Eliot’s Eats had grand ideas when she started reading the book (I think many of us did…). She says about the book: I had not studied anything this close since graduate school and I had not eagerly underlined and penned my own thoughts in the margins since my undergraduate days. Bard’s writing style lent itself to some “aha” moments (or at least for me) as she discovered a new identity in a foreign land. My copy of Lunch in Paris began to resemble the dog-eared copies of novels that stuffed my backpack in college.I love her conversational style and her ability to not take herself too seriously. However life had other plans for her and all she managed to whip up was a nice pot of mint tea. No worries though, the book will still be there for future references! 2. Tina from Life in the Slow Lane at Squirrel Head Manor loved the book and was really shaken by the descriptions of Yanig’s condition and the fact that the family never got a second opinion. Tina says: This is a memoir I would recommend for anyone who enjoys reading about France, cross cultural exchanges as well as some fine recipes. 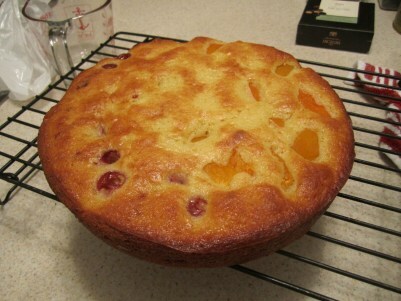 We have already made several and plan to try more soon. 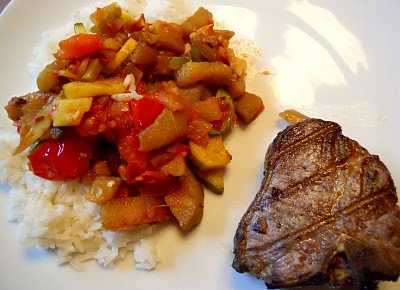 She made two delicious recipes from the book: pasta ala Gwendal and Ratatouille served with grilled lamb. 3. 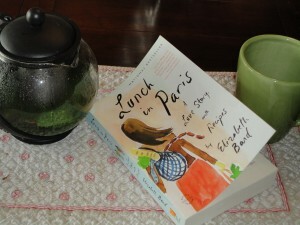 Kaye from In Kaye’s Kitchen admits that Lunch in Paris is not the kind of book she would pick herself, but could relate with the book in many wayssince she also moved to France herself (early retirement rather than love). She had to laugh at the importance of having your name on a utility bill and now keeps a copy in my checkbook, in case I need to show it somewhere. 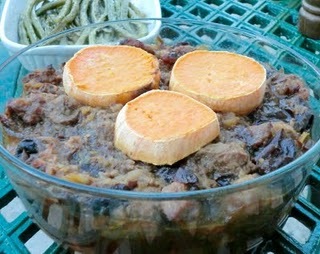 Kaye also made a whole meal inspired by the book: haricots verts (green beans) with walnut oil (she actually produces her own), Lamb Tagine and a cherry clafoutis. What a lovely dinner for a springtime evening! 5. Claudia of Honey from Rock was the only one of the readers to really comment on how annoying Parisians are: By the time I’d finished, it was perplexing indeed why anyone would subject themselves to the place long term. Only true love. Good food and beauty are available in more congenial locales. Though, as long as you’re not having to deal with the attitudes yourself, it can be humorous. 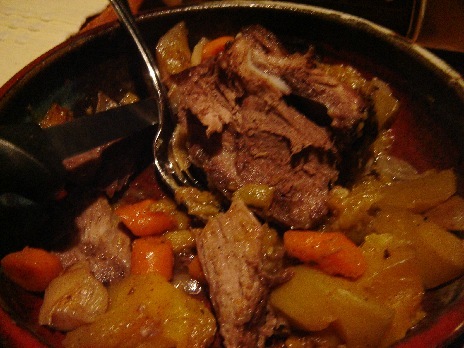 Claudia made the Roast Wild Boar but used green mango instead of apples and Mango liqueur instead of Calvados as these were theclosest local ingredients she could get her hands on.I’d like to try that version too! 6. Maria of Organically Cooked was the reason why we all red this book in the first place. You can read her initial review of the book here. 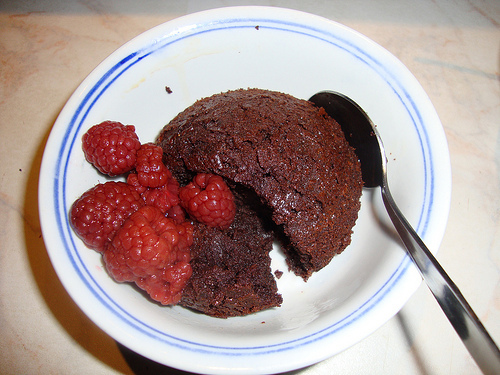 She found many similarities between herself and Elizabethe in the way they both cooked in tiny spaces with loads of local, seasonal ingredients and the first time around she decided to invest in some ramekins to make Pots de Chocolat. Since then Maria has made several dishes from Lunch in Paris which is quite remarkable as her family is not always open to novelties. I think this strongly proves that good food is just universal! 7. Heather of girlichef admits that “the food scenes and the recipes woven into every chapter…every tale…are probably my favorite parts of the book… I love that food is not an afterthought, but a normal part of everyday life for Elizabeth, Gwendal, and her new extended family. I’m pretty sure food is one of the reasons she fits into the French scene so well“. 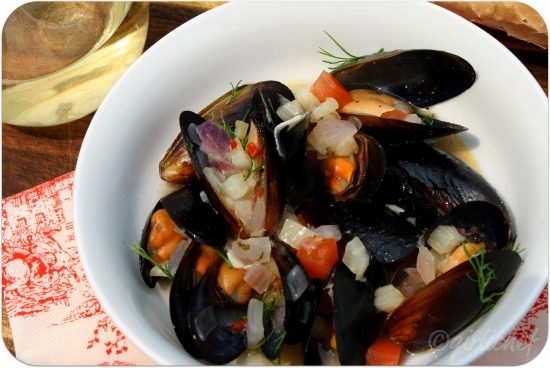 Heather made mussels with white wine and fennel because she “was inspired by the vacation on the island of Bell-Ile, off the coast of Brittany…and American body image vs. French body image. Plus, my own husband has been passively reminding me that he’s been wanting mussels for more than a year (far more) now.”. 8. Alicia of Foodycat admits that she was expecting a bit of the cliché:affectionate mocking of the quaint local customs, realisation that they are so much more in touch with the circle of life than we are (whichever peasantry is the exotic other on this occasion), self-deprecating stories about cultural ineptitude and a couple of recipes featuring ingredients that are hard to come by outside that particular village. That is doing it a great disservice; Lunch in Paris is not that book. 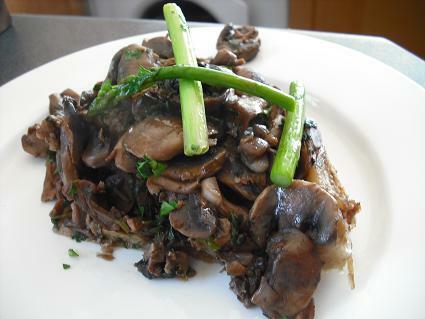 Alicia was inspired to make a Mushroom Tarte Tatin, not a recipe from the book, but quite French in spirit nonetheless. 9. Rachel of the Crispy Cook admits that she fell in love with Gwendal and that she has a few dog-eared pages in Bard’s book for delicious recipes that I will make when various edibles come into season. 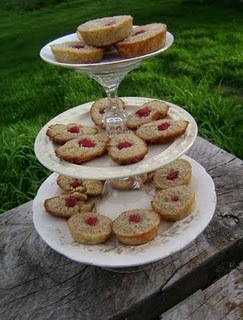 For CTB she made raspberry financiers easily transforming the recipe to gluten free by substituting the flour with brown rice flour. Oh, and she also made the cake stand herself! 10. 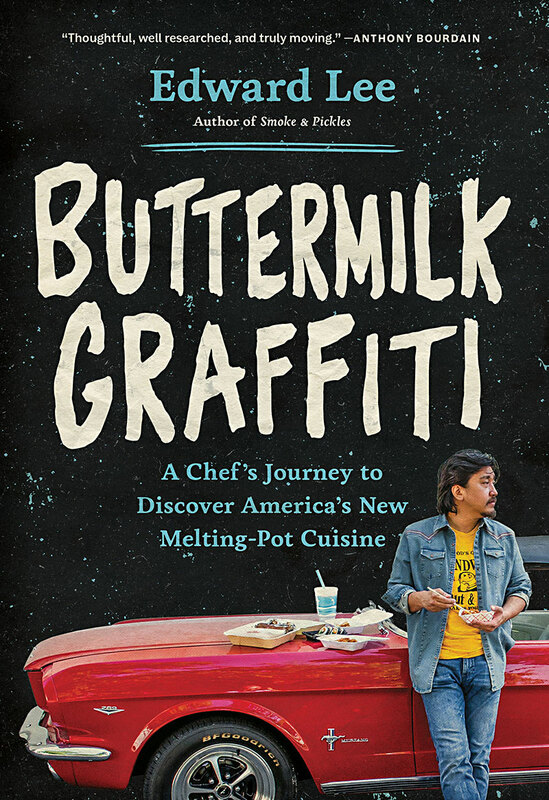 Deb of Kahakai Kitchen liked the book as well. She says: [Bard] writes conversationally, like chatting over a cup of tea with a fun and witty friend and so descriptively that you share her experiences and can almost taste the food. Speaking of food, there are plenty of delectable recipes at the close of each chapter that caused by copy of the book to be studded with sticky tabs (and quite possibly a few drool spots). 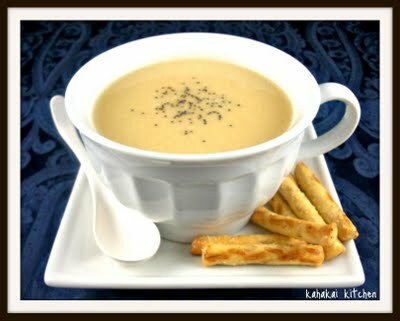 Deb made the Cauliflower and Tahini soup from the book, but changed teh recipe around a bit to suit her new dietary challenges and used her own, homemade tahini! 11. 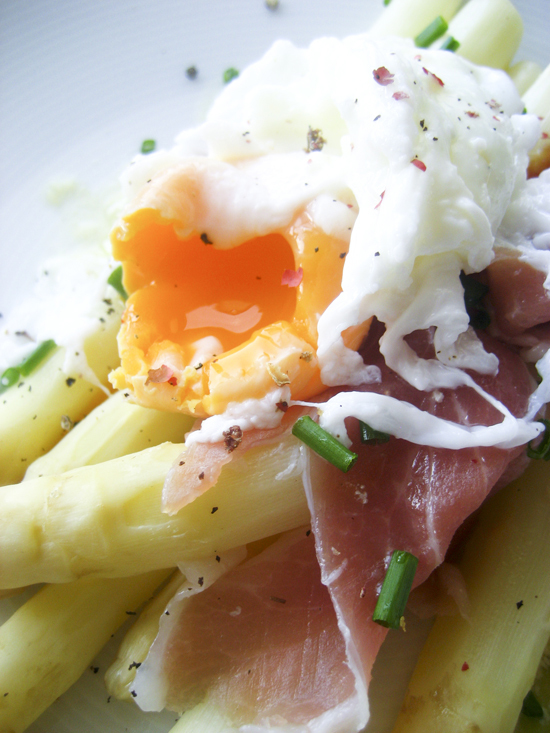 I cannot participate in this round since I am hosting, but you can read all about my white asparagus with prosciutto and poached egg here.